The design team has been busy for weeks designing the gardens, selecting the right plants for the right place, and finding and ordering the 785 individual plants chosen for the design. After the design was complete they compiled a list of all the plants names and quantities. Next, a member of the team did a cost analysis using the cost from various nurseries on size (gallons, or flats if needed, etc.) The design team got back together and went through the list plant by plant and compared prices at each nursery. Based on size/availability they determined where they would buy the plants. Part of the process was to find the plants locally so there won’t be frustration or disappointment when someone sees a really cool plant they want and then find out they can’t get it anywhere locally. So, in the end if you see it in our garden you should be able to buy it from a local nursery. The plants have been ordered from Ft Collins Nursery, Little Valley Nursery (Brighton), Eaton Grove, and Flowers for 3 Greenhouse (Milliken). The team took the design and presented it to the Island Grove Park board of directors and they enthusiastically approved the design. Here are the gardens that have been selected from Garden in a Box. (Hint: If you click on the pictures they will enlarge and you can read the plant names – or you can click the link to Garden In A Box and review the plans and plants for the selected gardens). The other side of the garden was all designed and plants selected by the design team. 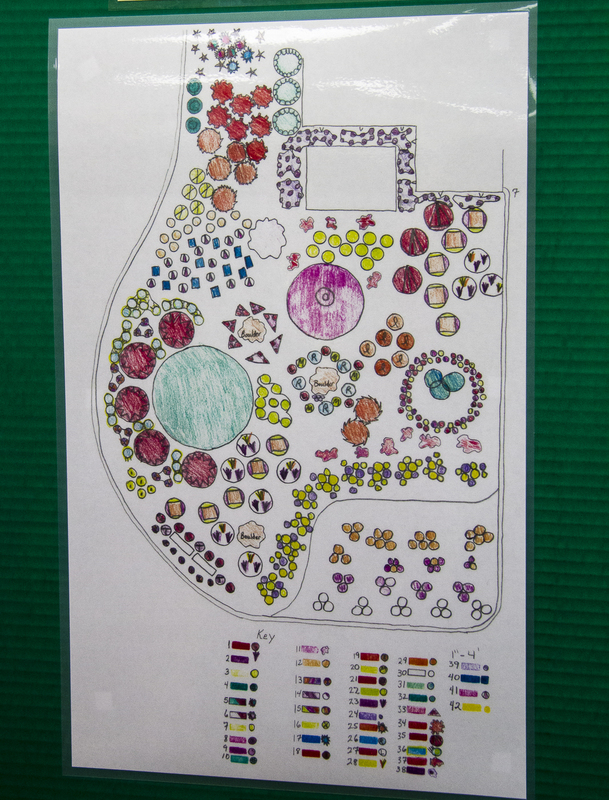 Here is the design plan and the plants they selected. Hopefully you can read the plant names on the board. The design has a key at the bottom showing there will 42 different plants used and the total of plants used will be 785. Some of the plants used: Turkish Veronica; Sunset Sonoran Hyssop; Denver Gold Columbine; Cheyenne Spirit Coneflower; Regal Torchlily; Hummingbird Trumpet Mint; Nearly Red Pineleaf Beardtounge; Colorado Gold Ganzania; Corsican Violet; Red Creeping Thyme; Mongolian Bells Clematis; Prairie Lode Sundrops; Snowmass Phlox; Giant Sea Kale; Windwalker Royal Red Salvia; Carol Macke Daphne; Alan’s Apricot Ice Plant; Narbonne Blue Flax; Dwarf Beachead Iris; Snow Angel Coralbells; Goblin Blanket Flower; Bijou Blanket Flower; Engelmann’s Daisy; Red Yucca, Moroccan Pincushion Flower; Tall Bearded Iris; Northern Lights Pansy; Turquoise Tails Blue Sedum; Starburst Ice Plant; Golden-flowered Prairie Zinnia; Fire Spinner Ice Plant; Remembrance Columbine; Blue Velvet Pansy; and Trumpet Daffodil Mix. Now, we should have shade and sun plants; and plants that will be blooming and overlapping all the seasons. Plants that are Xeric and water-wise. Plants that match a color scheme in each section and blend in with the next section. Plants that will live in our planting zone. Plants that you can find locally if you like them. Whew. Thanks design team! What a HUGE job and excellently executed. The plants should be installed in May and be looking great for the ribbon cutting during the Weld County Fair. We’re excited and can’t wait to see what it’s going to look like. We can’t wait for you to see it too! This entry was posted in Colorado Master Gardeners, Demo Garden, Garden design, Uncategorized, Weld County Extension and tagged City of Greeley Conservation, Colorado Master Gardeners, creating a new garden, CSU extension, Demo Garden, designing a garden, designing a new garden, Garden design, garden in a box, master gardeners, renovating a garden, Right Plant Right Place, water-wise, Weld County, Weld County Colorado Master Gardeners, Weld County CSU Extension, Weld County Extension, Weld County Master Gardeners, Xeric. Bookmark the permalink. 1 Response to We have a design!! This is an amazing article. I love the detailed list, what an amazing amount of work you guys have put into this. Thanks for sharing!